While staying at the iL Casale in San Pietro a Cegliolo, I got up before most others (5:30 AM) and hunted for something in the Tuscany countryside to capture in the morning light. 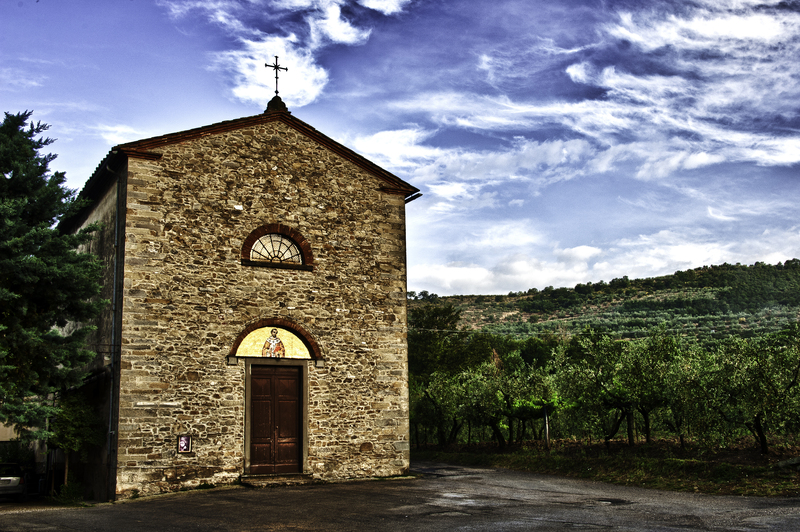 In yesterday’s article, I shared a couple photos of a small old church that I had noticed from a taxi while traveling to Cortona. On a subsequent early morning, I was shooting the fog covered mountains as I waited for the sun to rise over the mountains when I heard the sound of church bells nearby. It was 6:00 AM, and it was not the church from the previous morning. I was too close to the iL Casale for it to be the same church, and the sound of the bells was coming from a different direction. I followed the sound of the bells up a winding narrow gravel road into the hills behind the iL Casale. The sound of the bells had stopped and the sun was beginning to crest the mountains, when I came upon a very small and very plain old church. The church seemed to be located in the middle of nowhere–that is, there was nothing nearby but olive groves and scattered modest homes. Although the little old church was incredibly plain for a church in Italy, it had a beautiful gold inlaid window over its entrance doors, and as the sun rose, it illuminated the gold inlaid window making it very brightly glow. Then, while shooting the church, the bells rang again at 6:30 AM, and recognizing the sound of the bells I knew I had found the church I heard when I was down the road. As you can see from the below image, the church is amazingly plain compared to the other churches and cathedrals we saw in Italy, but as you can also see, the gold inlaid window was glowing from the rising morning sun and made for a great photograph. My timing was perfect. The light was perfect. It was quite a sight to see. Tuscany is a fantastic place for photography! Click of the photo to see it in more detail. Did you get to go inside? Was it as plain on the inside as it was on the outside? In Camoglia the church there is very plain on the outside, too, but step inside and you would be shocked by all the gold, statues, and paintings. As this was a seaside church, it was plain from the view from the sea (and sailors … pirates?) but inside was breathtaking. Smart people! No, I did not get inside, and other than the bells ringing, it looked like it might have been converted into a private residence. I will add a photo from the back looking up to the smallest bell tower and bells–not pretty.